Thinking about what to bring to the table as a guest in a workshop that is an almost one year journey to the underworld, I go outside and put on the wooden shoes that are standing next to the door always. My now deceased father gave them as a present to his son-in-law, my former partner. They are too big for me but they come in handy when wandering through my forest garden. I like walking in their shoes, just like I like how they walk with me always on any of my long walks. I pick a leaf from the rhododendron, thinking it looks like a map and I put it inside on the table, trying to read the map. I am not sure if it is a map from the past or for the present, from my state of mind possibly, it might be a treasure map and if I walk the lines, I will find the answer to the question that is most puzzling me. Are the dewdrops lakes or sad moments? What is this small brown path? How often did I find myself on the big straight line in the middle? Did I wander to every part of its edge? Should I check out what is on the other side? Maybe I will go out later and just walk this map and see what happens. When I take away the leaf, I see that the table is a map in itself. It is my grandmother’s table, I dragged it around Europe many times, together with the memories of the Sunday’s when we would all gather around this table, my father’s nine sisters and two brothers and their partners drinking coffee or sweet wine and the children playing on the floor. My grandmother moving around while my grandfather was silently sitting in a corner listening. It makes me think of the past, but I try to read it as a map for the future though. I am currently in the fragmented area on the bottom to the left and after some circular movements there are two paths leading up straight out from the middle. One won’t last, it is made of waterdrops that will dissolve. The other one carves deep into the surface. I am currently thinking about the two places I want to move to, the city of Barcelona and a small village in the South of Poland, but before I get there, I have to get out the chaotic, condensed remnants of the last 17 years. There was another map in-between, when I took the leaf out of my hand and put it on the table. We all have this map in our hands, different maps from person to person, from left hand to right hand. I never read this map but I like to place things on it, feel their weight. 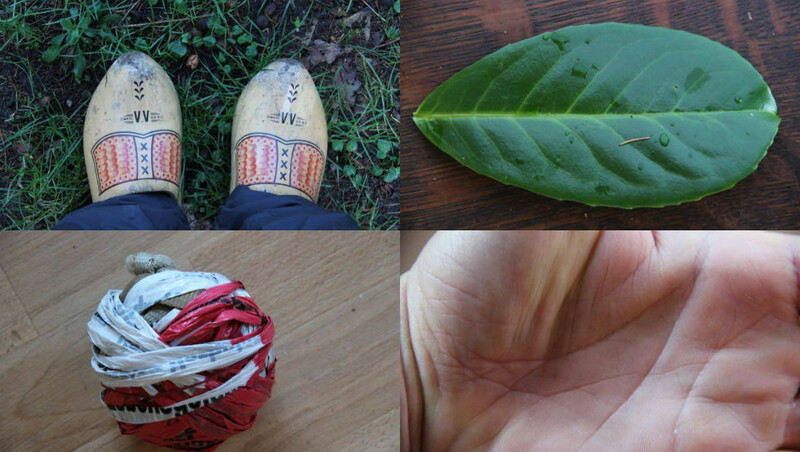 I look at one of the balls I made on a long walk from Amsterdam to Vienna last year, one ball a day, every small sphere representing that day’s walk, made out of everything I found on that day that could be tied together. Every line a part of that day’s story, every knot a person I met on the road. Somebody suggested they might be rambler’s rosaries. I like that thought. I unroll it and it forms a map on the floor. A map of a new story that resembles the original one, the one I wrote down on the day this tiny globe got assembled but has transformed again in my memory. I will roll it up later again to feel how while letting the rope and string go through my fingers, the people from that day walk around in my head. I struggled in the last days to recover all my material about walking and mapping from my dying computer and the numerous hard disks where I stored everything but without ever having the time to organise it. My website is horribly outdated and I never managed to put all my videos online. But only because this process is frustrating me and I can’t get a grip on the chaos of all the things I made in the last decade, I take breaks from it, trying to forget it for a while. It is in those moments that new things happen and lines are being thrown out to things I did before, things I almost forgot. In the chaos a new order is being created, you could call it a map even. A map with “now” in the center. If you stay there long enough, the rest of the map becomes clear automatically and it will be easy to walk into the future. Dear Monique … If you are in the UK any time beyond October this year, come to Winchester and give a talk on your work at the School of Art where I run an MA in contemporary practice. Hi Nick! That’s a great idea. I will put you and Monique in touch by email, in case she hasn’t spotted this comment.